This brief post is a correction of a previous entry. Last year I showed what I thought were shatter cones collected many years ago in Adams County, Ohio, by the late Professor Frank L. Koucky of The College of Wooster. James Chesire commented on the post and said it was more likely the specimens were cone-in-cone structures produced by burial diagenesis not bolide impacts. When he sent me the photo above of real shatter cones from the Serpent Mound impact region in southern Ohio, I knew he was correct. Shatter cones have distinctive radiating, longitudinal fractures not seen in similar conical structures in limestones. The above shatter cones are in an unknown Ordovician limestone. 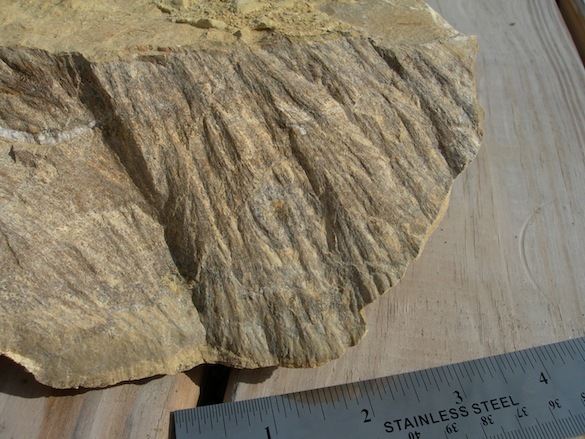 Both shatter cones and cone-in-cone structures are nevertheless pseudofossils in that they are both sometimes confused with organic structures like corals and chaetetids. I shall never mix them up again! Thanks for the correction, James. Carlton, R.W., Koeberl, C., Baranoski, M.T. and Schumacher, G.A. 1998. Discovery of microscopic evidence for shock metamorphism at the Serpent Mound structure, south-central Ohio: confirmation of an origin by impact. Earth and Planetary Science Letters 162: 177-185. Dietz, R.S. 1959. Shatter cones in cryptoexplosion structures (meteorite impact?). The Journal of Geology 67: 496-505. Sagy, A., Fineberg, J. and Reches, Z. 2004. Shatter cones: Branched, rapid fractures formed by shock impact. Journal of Geophysical Research 109: B10209. Shaub, B.M. 1937. The origin of cone-in-cone and its bearing on the origin of concretions and septaria. American Journal of Science 203: 331-344.